SEN. LAMAR ALEXANDER (R-TN): The Democratic proposal would allow the Senate to change its rules with only 51 votes, ending the historical practice of allowing any senator at any time to offer any amendment, until 60 senators decided it's time to end the debate. As Investor's Business Daily wrote, quote, "The Senate Majority Leader has a plan to deal with the Republican electoral success. When you lose the game," the newspaper said, "you simply change the rules. When you only have 53 votes, you lower the bar to 51. This is called election nullification," unquote. The constitutional option gets its name from Article I, Section V of the Constitution, which states that "Each House may determine the Rules of its Proceedings." In order to fulfill this constitutional order, the Senate must be able to, well, determine its rules. A filibuster, technically, is a way to stop the Senate from determining something by refusing to allow it to move to a vote. Because stopping the Senate from considering its own rules would be unconstitutional, the chair can rule against the filibuster, and the Senate could then move to change its rules on a majority vote. One caveat: Many people, including Udall himself, believe this has to happen at the beginning of a new Congress. If it doesn't happen at the beginning of a new Congress, then Congress is considered to have acquiesced to the previous Congress's rules, and a filibuster against further rule changes wouldn't interrupt the constitutional right to determine the rules. The Senate exercises its constitutional authority to determine its procedural rules either implicitly or explicitly. Once a new Congress begins, operating under existing rules implicitly adopts them 'by acquiescence.' The Senate explicitly determines its rules by formally amending them, and the procedure depends on its timing. After Rule 22 has been adopted by acquiescence, it requires 67 votes for cloture on a rules change. Before the Senate adopts Rule 22 by acquiescence, however, ordinary parliamentary rules apply and a simple majority can invoke cloture and change Senate rules. The Constitution in article I, section 5, says that each House shall determine the rules of its proceedings. Now we are at the beginning of Congress. This Congress is not obliged to be bound by the dead hand of the past. The first Senate, which met in 1789, approved 19 rules by a majority vote. Those rules have been changed from time to time... So the Members of the Senate who met in 1789 and approved...that first body of rules did not for one moment think, or believe, or pretend, that all succeeding Senates would be bound by that Senate.... It would be just as reasonable to say that one Congress can pass a law providing that all future laws have to be passed by two-thirds vote. Any Member of this body knows that the next Congress would not heed that law and would proceed to change it and would vote repeal of it by majority vote. Senator Thomas J. Walsh (D-MT) first advocated using the constitutional option in 1917. Like Byrd, Walsh reasoned that a newly commenced Senate may disregard the rules established by a prior Senate, including the rules governing filibusters, and adopt new rules in their stead. During this process, Walsh explained, the Senate would revert to the powers set forth in the U.S. Constitution and rely upon traditional parliamentary procedures, which contain procedural mechanisms to control filibusters. CLAIM: Sen. Alexander Claimed That Democrats, Not GOP, Are "The Real Party Of No" And "The Real Obstructionists"
SEN. LAMAR ALEXANDER (R-TN): But the demise of the Senate is not because Republicans seek to filibuster. The real obstructionists have been the Democratic majority, which for an unprecedented number of times used their majority advantage to limit debate, not to allow amendments, and to bypass normal committee consideration of legislation. To be specific, according to the Congressional Research Service, number one: The Majority Leader has used his power to cut off all amendments and debate 44 times, more than the last six Majority Leaders combined. Number two, the Majority Leader has moved to shut down debate the same day measures are considered nearly three times more on average than the last six Majority Leaders. And number three, the Majority Leader has set the record for bypassing the committee process, bringing a measure directly to the floor, bypassing committees, 43 times in the last two Congresses. [...] So the real party of no is the majority party that's been saying no to debate, no to voting on amendments that minority members believe improve legislation and express the voices of the people they represent. 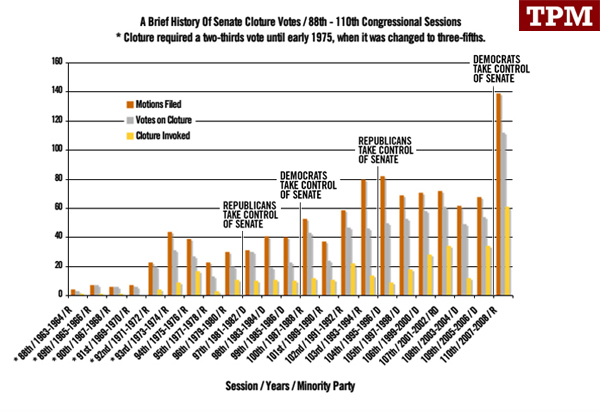 These are the numbers on cloture over the last several decades. Often, but not always, cloture is employed by senate majority leaders in response to filibuster threats from the minority. Cloture isn't always necessarily correlated with filibusters, but broadly speaking, the two often go hand in hand. What's particularly striking here is the GOP's use of filibuster threats, and the correlated increase in Democratic cloture motions. Take, for instance, the huge spike in cloture motions filed from the Republican-led 109th Congress in 2005-2006 to the Democratic-majority 110th in 2007-2008. "It is the most striking in history," American Enterprise Institute resident scholar Norm Ornstein told TPM. What happened, Ornstein says, is that during the last two years of President George W. Bush's second term, Republicans offered "no initiatives to speak of." The initiatives were coming from the Democrats, and the Republicans wanted to kill 'em, or slow things down. Republican filibuster threats, Ornstein said, were "like throwing molasses in the road." CLAIM: Sen. Alexander Claimed Democratic Rules Reform Proposals "Destroy Minority Rights" And Are A "Destruction Of The Senate"
SEN. LAMAR ALEXANDER (R-TN): I have said that to do so would destroy minority rights, destroy the essential forum for consensus that the Senate now provides for difficult issues, and surely guarantee that Republicans will try to do the same thing to Democrats in two years. More than that, it's hard to see how Democrats can gain any partisan advantage from this destruction of the Senate. Reid has heard the calls. But his answer will surely disappoint: Sorry. It can't happen. Reid's office has studied the history of the filibuster and analyzed what options are available. The resulting memo was provided to the Huffington Post and it concludes that a filibustering Senator "can be forced to sit on the [Senate] floor to keep us from voting on that legislation for a finite period of time according to existing rules but he/she can't be forced to keep talking for an indefinite period of time." As both Reid's memo and Dove explain, only one Republican would need to monitor the Senate floor. If the majority party tried to move to a vote, he could simply say, "I suggest the absence of a quorum." The presiding officer would then be required to call the roll. When that finished, the Senator could again notice the absence of a quorum and start the process all over. At no point would the obstructing Republican be required to defend his position, read from the phone book or any of the other things people associate with the Hollywood version of a filibuster. "You cannot force senators to talk during a filibuster," says Dove. "Delay in the Senate is not difficult and, frankly, the only way to end it is through cloture." In an interview Wednesday, Udall explained the ins and outs of that particular proposal. "What we seem to have the most consensus on, is what I would call... a talking filibuster," Udall told me. "Rather than a filibuster which is about obstruction." As things currently stand, the onus is on the majority to put together 60 votes to break a filibuster. Until that happens, it's a "filibuster," but it's little more than a series of quorum calls, votes on procedural motions, and floor speeches. The people who oppose the underlying issue don't have to do much of anything if they don't want to. Here's how they propose to change that. Under this plan, if 41 or more senators voted against the cloture motion to end debate, "then you would go into a period of extended debate, and dilatory motions would not be allowed," Udall explained. As long as a member is on hand to keep talking, that period of debate continues. But if they lapse, it's over -- cloture is invoked and, eventually, the issue gets an up-or-down majority vote. That doesn't do away with the principle of unlimited debate. If the minority is determined...it can wait out the majority and force them to pull the legislation. SEN. LAMAR ALEXANDER (R-TN): Now what would it take to restore today's Senate to the era of Senator Baker and Senator Byrd? Well, we have the answer from the master of the Senate rules himself, Senator Byrd, who in his last appearance before the Senate Rules Committee on May 19, 2010 said, quote, "forceful confrontation to a threat of a filibuster is undoubtedly the antidote to that malady." [...] Then Senator Byrd went on, quote, "in his notes to the Constitutional Convention on June 26, 1787, James Madison recorded that the ends to be served by the Senate were, first, to protect the people against their rulers. Second, to protect the people against the transient impressions into which they might themselves be led. They themselves as well as a numerous body of representatives were liable to err also from fickleness and passion. A necessary fence —" this is Byrd quoting James Madison — "against this danger would be to select a portion of enlightened citizens whose limited number and firmness might seasonably interpose against impetuous counsel." That's the end of that quote. "That fence" Senator Byrd said, "was the United States Senate, the right to filibuster anchors the necessary fence but not a right intended to be abused." And then Senator Byrd concluded, "there are many suggestions about what we should do. I know what we must not do. We must never ever, ever, ever tear down the only wall, the necessary fence, this nation has against the excess of the executive branch and the resultant haste and tyranny of the majority." That was Senator Byrd in his last appearance before the Senate Rules Committee. FACT: Sen. Alexander Skipped Sen. Byrd's Condemnation Of Republicans For "Threaten[ing] To Filibuster Almost Every Matter"
The italics below indicate Alexander's quotation of Byrd; the bold text indicates what Alexander omitted. SEN. LAMAR ALEXANDER (R-TN): Now in the November election, voters showed that they very well remember the passage of the health care law on Christmas Eve 2009. ... Those who didn't like it were told, we won the election, we'll write the bill, we don't need your votes. The majority's attitude was just that, and one person even said, you can read it after we pass it. [...] This was in December, the snow was coming down, and then they brought it out, more than 2000 pages. We were told you can found out what's in it after, y'know, after we, after we pass it. You've heard about the controversies within the bill, the process about the bill, one or the other. But I don't know if you have heard that it is legislation for the future, not just about health care for America, but about a healthier America, where preventive care is not something that you have to pay a deductible for or out of pocket. Prevention, prevention, prevention-it's about diet, not diabetes. It's going to be very, very exciting. But we have to pass the bill so that you can find out what is in it, away from the fog of the controversy. Furthermore, we believe that health care reform, again I said at the beginning of my remarks, that we sent the three pillars that the President's economic stabilization and job creation initiatives were education and innovation-innovation begins in the classroom-clean energy and climate, addressing the climate issues in an innovative way to keep us number one and competitive in the world with the new technology, and the third, first among equals I may say, is health care, health insurance reform. Health insurance reform is about jobs. This legislation alone will create 4 million jobs, about 400,000 jobs very soon.